Using the formidable fortune earned running, among other things, a casino in Macau, Theodore 'Teddy' Yip started backing drivers during the mid-1970s. By 1977, Yip was the primary sponsor for Patrick Tambay who drove the second Ensign during the second half of the season under the Theodore Racing banner. For 1978, Theodore Racing commissioned Ralt's Ron Tauranac to create a bespoke Formula 1 car. Dubbed the Theodore TR1, the Tauranac designed machine was a conventional 1970s Cosworth 'kit car' and its lines resembled the contemporary Ralt single seaters. It was built around aluminium monocoque chassis, which used the Cosworth DFV V8 engine and Hewland gearbox as fully stressed members. The front-end featured double wishbones, while a multi-link layout with in-board mounted ventilated discs were used. The first of two TR1s debuted in the two South American rounds that kicked of the 1978 season. Both in Argentina and Brazil, American Eddie Cheever failed to make the grid. This car was then destroyed in a practice accident at Kyalami with Keke Rosberg behind the wheel. He switched to the sister car for the race for which he actually qualified but retired in what would be the TR1's only Grand Prix start. Upon its return to Europe, the second TR1 was entered in the International Trophy at Silverstone where Rosberg excelled under dreadful conditions. After qualifying a lowly 11th on the grid, Rosberg's wet weather skills saw him overcome the Theodore's shortcomings and score a surprise victory. The car was entered for Rosberg in four further Grands Prix but he failed to qualify on each occasion. 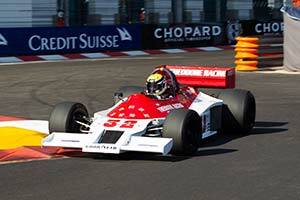 Disappointed with the results of his first Grand Prix car, Theodore switched to a pair of Wolf cars for the final rounds of the 1978 World Championship. After running cars in other series for two seasons, Theodore Racing returned to Formula 1 with their own cars for three more seasons from 1981 through to 1983. Rosberg's International Trophy win with the TR1 remained the teams only Formula 1 victory.